THE LIZARD BRAIN developed more than 100 million years ago and is responsible for human survival. The actions and emotions that spring from that ancient reptilian brain do so automatically, without us having to think about it. They are mostly triggered by sound. While most of the audio around us is dealt with by the front part of our brain, the primeval sound of the GT3 RS engine in anger engages the primitive cortex. It’s like the hiss of an ancient predator. A lizard brain sound. The sportiest Porsche at the moment is still breathing naturally. 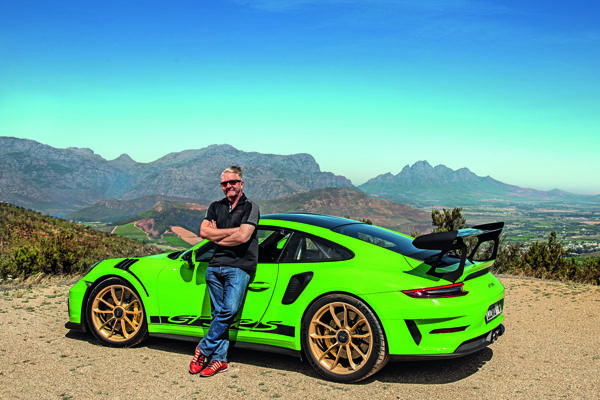 Its sibling, the 515kW Porsche 911 GT2 RS might be faster (top speed of 340km/h instead of 312 km/h) but it is turbo-assisted with less downforce, hence the glorious noise coming from the large-diameter dual end pipes of the GT3 RS. In order to save weight, the engineers at Porsche Motorsport in Weissach reduced the sound absorption in the cockpit, resulting in even more interior aural pleasures, a wellness treatment for the ears of petrolheads. The bucket racing seat is hard and has a fixed backrest. They could have saved a couple more grams by leaving the entertainment system out. The engine should be the sole entertainer. Another redundant part in the car is the rear-view mirror. As soon as you aim for the horizon in the RS, there won’t be anybody close behind you. But seriously, the developers shed a lot of weight in the newest Porsche RS family member of rear-wheel-driven rockets. It weighs just 1 430kg. The large rear wing is made of ultra-lightweight carbon. And an optional Weissach package strips even more weight, almost 30kg, off the ride. Most of the magnesium parts are then replaced by carbon. A titanium roll cage sheds 12kg alone. 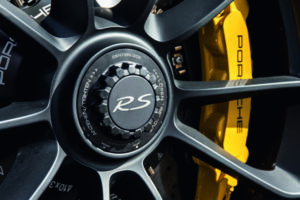 Of all street-legal vehicles, the GT3 RS is the closest to a race car Porsche has ever built. And that’s in terms of power and chassis tuning. The lightweight construction combined with optimum racetrack dynamics, active suspension, rear-axle steering, special racetrack ABS and road-approved track tyres enables owners of this 911 not only to take part in a race with no modifications to the car, but to win it. The GT3 RS screams racetrack. Drive it to a course, destroy everyone else and go home in relative comfort, depending on the road surface. Even parked, the car takes your breath away, and especially in this almost obscene lizard-green. Perhaps it’s the giant rear wing, the enlarged air intakes or the 20″ front and 21″ rear wheels that make this Porsche look fast even when it’s standing still. So let me see just how fast. I grab the Alcantara sport steering wheel and climb into the cockpit. The bucket racing seat is hard and has a fixed backrest. Only the legroom can be adjusted. There is a massive roll cage behind me, a racing harness and a fire extinguisher. But the car fits like a glove. Everything inside is purist and driver-focused. Man and machine merge into one. The ceramic brake discs offer impressive braking performance. I push the start button and my lizard brain engages. The car is intoxicatingly fast but, as mentioned before, made for perfectly surfaced racetracks. The slightest bump in the road makes the Porsche jolt like a mechanical bull and I have to hold on tightly to the steering wheel. Precision before comfort. Let’s search for some smooth tarmac. Helshoogte Pass, outside Stellenbosch, is a promising start. Luckily traffic is light and the wide bends are two-laned. Once again I am awestruck by the ballistically quick response of the boxer engine. The next piece of twisty road is even smoother: Franschhoek Pass. To add to the drama provided by the car, mighty clouds glide rapidly over the mountain range. Roaring past the vineyards, I imagine the ripe grapes, like me, getting goosebumps. Maybe not so good for wine but surely great for grappa. Luckily all this power and performance come with a safety net. PSM helps you to survive this frighteningly fast car. PSM? Porsche Stability Management assists in those tricky situations. Too early on the gas after a tight bend? PSM. Sliding after a sudden downshift? PSM will catch you because it can. In the meantime I am on my favourite road, Clarence Drive, the R44 between Gordon’s Bay and Rooiels. And the GT3 RS won’t overtake me with its rear end, thanks to PSM. The road surface is once again perfect and the twisty curves enable some spirited driving. 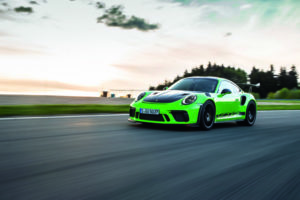 The enormous downforce of the GT3 RS is responsible for the unbelievable traction, defying the laws of physics in almost each and every bend – a raw emotional and truly exhilarating experience. My drive wouldn’t be complete without stopping at the end of the steep private road leading up to the Steenbras Dam gate. It is so South of France, Corniche de Crêtes and Rally Monte Carlo. It is also one of only a few mountain roads in South Africa that has a hairpin bend in excess of 180°. And the views from the top are so beautiful that you might be tempted to finally take your eyes off the green lizard for a second. Could there be a more appropriate ending to a trip in Porsche’s race car for the road? By the way and just out of interest, who is going to buy a car that doesn’t leave you with much change from R5 million? Well, according to Porsche, the typical GT3 RS owner has in his garage, on average, another three cars for day-to-day driving.